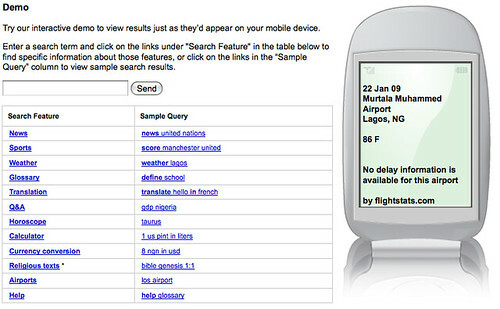 Yesterday Google announced that they had enabled searching for information by mobile phones in Nigeria and Ghana. You simply text in your query in to Google’s shortcode, which is 4664, and wait for a response by SMS. After a quick check with someone at Google Kenya, I verified that these are the only two African countries that Google has released SMS search in at this point. It seems that this would be quite simple for Google to turn on in almost every country in Africa, so I wonder if one of the bottlenecks is actually getting the specific shortcode that they want (4664 or “GOOG”). Though it’s hit or miss on some of the queries right now, at least it was as I tested it through the web interface, it’s still a valuable service that I hope the make available in more countries soon. They’re following the basic rules for technology in Africa, which is to design for the lowest common denominator: SMS-only mobile phones. I think Google’s approach will be to do what they’ve been doing in other territories – get people ‘hooked’ on their services and then slowly roll out more. What they roll out, where and in what order will likely depend on the network environment, the handset environment and at what points Google Search ‘sticks’. As you rightly state, always sensible when talking Africa and mobile to start with the lowest common denominator – the text message. Very Interesting… I wonder how the Google investment in Mobile Planet will come into play with such services in East Africa and in particular Kenya. I hope Google will expand some of it’s services to meet the needs of African people. I live in Ghana, and yes it does work – but at the moment only on one of the five mobile networks – Tigo. I still need to try it out a bit more though. Google thank you 4 remembering Nigeria.